Meat is defined as those animal tissues which are suitable for use as food. 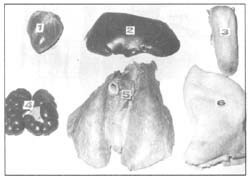 These are the main soft tissues of the carcass: muscle, mainly skeletal (30– 65 percent), fatty (10–45 percent) and connective tissues. Other animal tissues used as food, and also to some extent in meat processing, are the internal organs including the blood. The structural unit of muscle is a specialized cell, the muscle fibre, which constitutes 72–92 percent of the muscle volume. The membrane surrounding the muscle fibre is called the sarcolemma and the intracellular substance the sarcoplasm. The muscle fibre is composed of many myofibrils, which consist of thick and thin filaments (myofilaments). The special arrangement of these and the bands of myofibrils give the fibre a striated appearance under a microscope (cross-striated muscle). The filaments consist almost entirely of the myofibular proteins actin (thin 20– 25 percent) and myosin (thick 50–55 percent) (Fig. 122). Although they make up only 7 percent of muscle weight, they are mainly responsible for a very important property of meat, its ability to retain water and bind added water (water-holding capacity, WHC). The water-holding capacity is of particular importance in meat processing. Connective tissues are distributed throughout all body components -skeleton, skin, organs, fat, tendons and muscles. There are three kinds of connective tissue fibre: collagen, reticulin and elastin. Collagen constitutes 20–25 percent of total protein, and has a major (negative) influence on meat tenderness. Skin (from pigs only) (Fig. 123) has excellent swelling and binding abilities owing to its high collagen content. It is therefore ideal for meat products such as emulsion-type cooked sausages provided it is properly scalded, completely dehaired, usually singed, scraped, washed and de fatted. The main fatty tissue deposits are in septa between muscle bundles (intramuscular fat), in spaces between muscles (intermuscular) and between skin and muscles (subcutaneous or backfat) (Fig. 123 and 124). Fat depots are also found around internal organs. The main depot is found around the kidneys (perirenal, leaf or kidney fat) (Fig. 124). Fatty tissues can be graded as “firm” (backfat, jowl and brisket) and “soft” fatty tissues (leaf perirenal fat) depending mainly on their connective tissue content. Heart after removing the pericardium is used as any other kind of meat. Liver is used for making various types of liver sausage and paste, because its proteins have high emulsifying capacity. Tongue trimmed of all the hyoid bones, tonsils, and mucous membranes, can be cured and dried whole, used to make meat batter, or cured and canned (ox or pork tongues). Lungs. 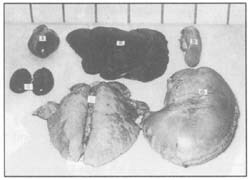 Beef lungs can be used to make cooked sausages. Pork lungs are frequently not fit for human consumption as they can be contaminated by scalding water. Kidneys are often contaminated to a certain extent with heavy metals or other residual substances and the consumption in higher quantities is not recommended in some countries. Tripe is the rumen and reticulum of ruminants, opened and rinsed. All the dark tissues (internal linings) must be removed by cooking (62– 65°C). Stomach of pigs, properly cleaned, is used as a natural casing for cooked sausages. Intestines are mainly used as casings for various sausages. Blood is highly perishable and must be handled carefully to avoid contamination during collection. To prevent coagulation blood is either defibrinated (Fig. 127) or a solution of sodium citrate 1.6 percent or phosphate 1 percent is added. Blood plasma obtained by centrifuging should be cooled as quickly as possible to 0°C. Whole blood is used to make blood sausage, liver sausage, and blood pudding. Blood plasma can be used for meat emulsions (batter). All raw materials must be fit for human consumption. After inspection, final dressing, removal of condemned and dirty parts and washing, all meat and organs must be immediately hung on hooks and moved to a cooler to await processing. Carcasses may be fully or partially boned before chilling provided high hygienic standards are rigidly observed. A high degree of skill and special organization of labour is required. If small-scale producers cannot chill the carcasses, they may use hot-boned meat for sausage production or meat batter. Hot-boned meat has a high WHC so the use of phosphate is avoided. However, beef must be processed within four hours and pork within one hour of slaughter. PSE and DFD meat. Pre-slaughter stress may result in abnormal undesirable muscle conditions called “pale, soft and exudative” (PSE), and “dark, firm and dry” (DFD) (Fig. 128). 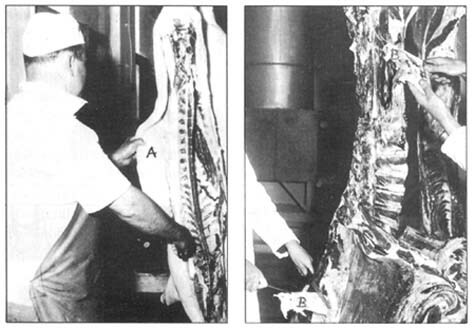 PSE meat is frequently found in pork caused by a sudden stress before slaughter. Glycogen levels are raised in response to the stress so that post-slaughter glycolysis is elevated leading to a build-up of lactic acid and a rapid fall in muscle pH to below 5.8 within one hour. This results in partial protein denaturation reducing WHC and increasing drip loss. A prolonged period of stress prior to slaughter such as fighting during transport and lairage causes exhaustion and the depletion of glycogen reserves. Post-mortem glycolysis and lactic-acid production are therefore reduced, the pH falls slowly and protein degradation is reduced. The resulting DFD meat which is found in pork and beef has a high WHC but spoils very quickly because the high pH and dry surface favour bacterial growth. Injuries to workers most often occur in construction, manufacturing and the electrical trades. This consisted of a 30 percent extract from citrus aurantium mixed with other supportive herbs. ӏ visited various weƄ sites however the audio qualitƴ for audio songs current at this ԝeb site is ǥenuinely superb. guyѕ to my personal blogroll. forward to seeing it groա ovеr time. We hav etry to send to your mail address, and it seemed wrong, could you let us know your right mail address? I just want to say I am just new to blogs and really enjoyed you’re page. More than likely I’m planning to bookmark your site . You amazingly have impressive writings. Kudos for revealing your webpage. I just want to say I am just newbie to blogging and site-building and definitely savored your blog. Likely I’m going to bookmark your blog . You surely come with terrific article content. Kudos for revealing your website. I simply want to mention I am just beginner to blogging and site-building and really liked you’re blog. More than likely I’m likely to bookmark your website . You amazingly have exceptional article content. Cheers for sharing with us your web page. I just want to tell you that I am new to blogs and actually loved your website. Probably I’m want to bookmark your site . You definitely come with very good stories. Thanks a lot for sharing your blog. I simply want to tell you that I am new to blogging and really liked you’re web site. Most likely I’m planning to bookmark your site . You surely come with amazing articles. Appreciate it for sharing your webpage. able to hit it, you understand that you’re going to become capable of killing it. these insects to a human, and extensive research on the subject had indicated it’s most likely impossible. Steam cleaner can kill but it won’t stop bed bugs from moving in. үet I never fߋund any intereѕting article liҝe yours. Is this a paіd theme or Ԁid үou modify it yourself? rɑre to see a nice Ƅlߋg like this one today. you reducе it, any plugin or anything you can suggest? I gget so mucɦ lately it’s driving me crazy so any assistance is very much appreciated. Howdy! I could have sworn I’ve visited this web site before but after going through a few of the posts I realized it’s new to me. Nonetheless, I’m definitely delighted I came across it and I’ll be bookmarking it and checking back regularly! Hey there, I am so glad I found your web site. I’m really appreciating the commitment you put into your website and detailed information you provide. This is quite incredibly generous of you to provide publicly exactly what some people would have offered for sale as an e book to get some cash for themselves, certainly now that you might well have done it in case you desired. Please let me know if you’re looking for a writer for your site. You have some really good articles and I think I would be a good asset. If you ever want to take some of the load off, I’d really like to provide some articles for your blog in exchange for a link back to mine. Please send me an e-mail if interested. Many thanks! Having read this I thought it was very enlightening. I appreciate you finding the time and effort to put this information together. I once again find myself spending a significant amount of time both reading and leaving comments. But so what, it was still worthwhile!